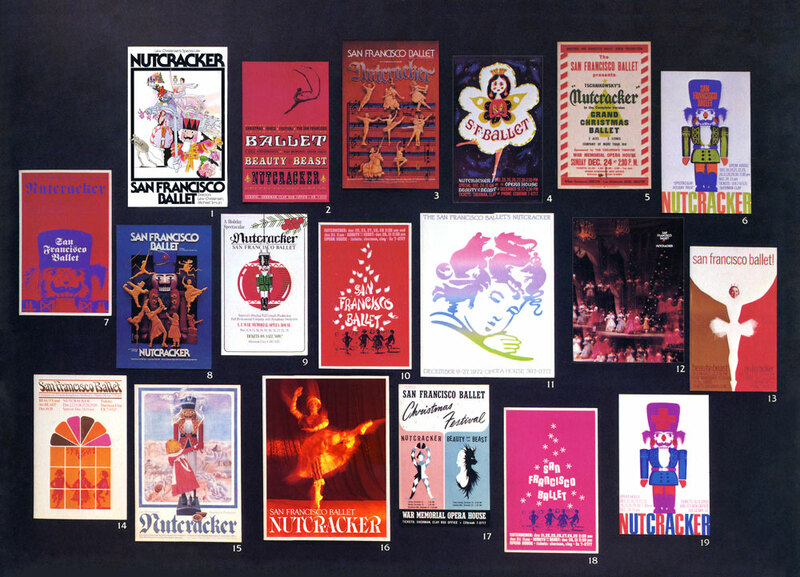 San Fran­cisco Ballet’s Nutcracker Posters 1960s‐1970s. The San Fran­cisco Ballet (founded as the San Fran­cisco Opera Ballet in 1933) is the oldest profes­sional ballet company in America. Willam Chris­tensen arrived in 1938. On Christmas Eve, 1944, he presented the first complete version Nutcracker ever staged in the United States. As a free­lance artist, I was lucky to have two oppor­tu­ni­ties in creating the Nutcracker poster and addi­tional printed items. The first poster, ”Dancing Doll”, started as a tracing pad thumb­nail sketch which was then shown to photog­ra­pher, Larry Keenan Jr. along with the Ballet’s b/w photo­graph from a past perfor­mance. Larry had a tech­nique that turned the simple photo into a mosaic of prisms and added color as well. The next year, I worked directly with Lew Chris­tensen. I offered four designs. I was surprised that he picked the most humorous of the group — with the mouse sneaking off of the poster. I have scanned two of the four layouts…that I offered, as shown below. Here also, photographed by Fred Sweiger, is a full collec­tion of the posters of local artists to promote the yearly event. 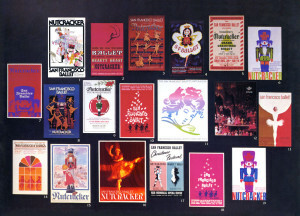 This collec­tion was on the inside cover of a 1980 Nutcracker brochure that was designed by Cal Anderson. The scanned image is not the best quality. If I had orig­i­nals of each…I could have shown them all more clearly. 1: Ann Thompson, 3 & 8: Norman Orr, 4: Sue Foster, 6, 7 & 19: Dale Smith, 11: Nicholas Sidjakov, 12: Fred Lyons, 15: Judy Clif­ford, 16: Larry Keenan Jr.